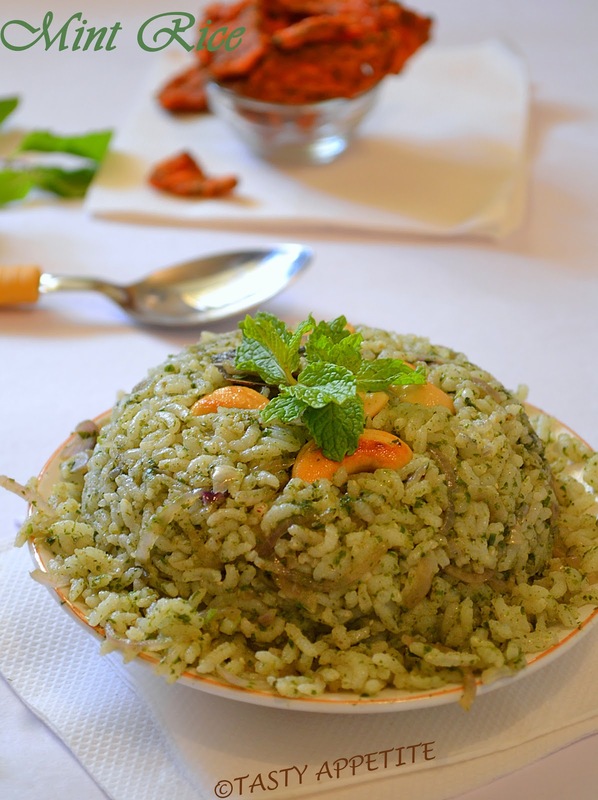 Pudina Rice is a delicious, aromatic & immensely flavorful rice dish..!! This is one of our family favorite variety rice dish. 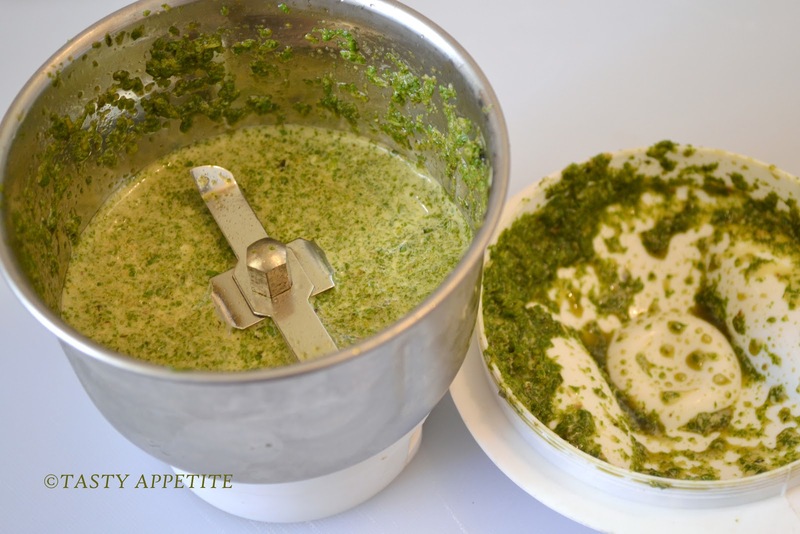 It is very easy to prepare and yummy to eat. Also, it makes a healthy lunch box menu, as the mint leaves contain a number of vitamins and minerals..!! 1. 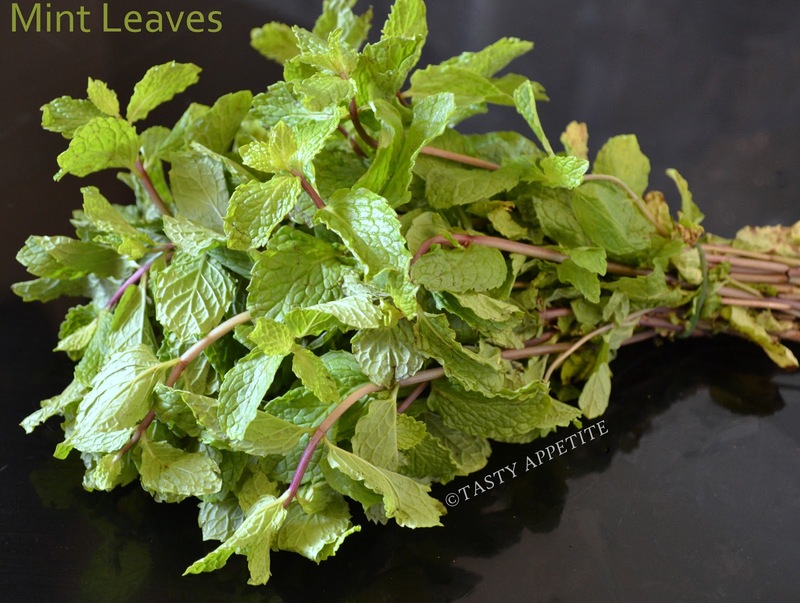 Wash and chop mint leaves to fine pieces. 2. Wash the rice and pressure cook it. 3. Spread the cooked rice in a plate and allow to cool to separate grains. 4. 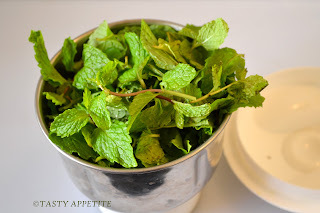 In a mixer, add mint leaves and green chilly. 5. Add little water and grind it to coarse paste. 6. Pour ghee in a wok / kadai and heat it in medium flame. 7. Add cashew nuts, biryani leaves, cinnamons and sauté for a minute. 8. 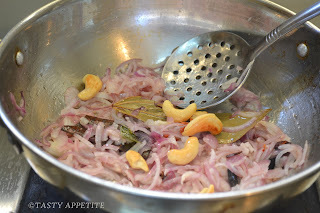 Add finely chopped onion and fry till transculent. 9. Add pudina paste, ginger garlic paste, salt and red chilly pwd. 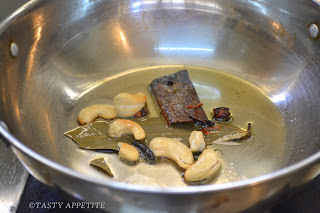 10.Fry them all together in low flame for 4 to 5 mins. 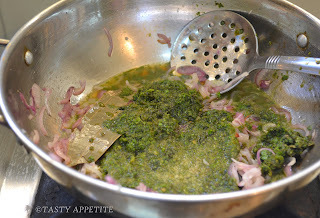 11.Now add this mixture to the cooked rice in wide bowl. 12.Add lemon juice to it and fluff gently. 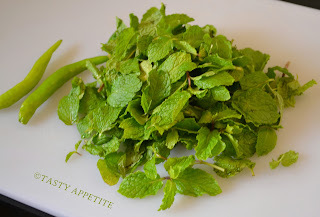 13.Tasty Pudina / Mint Rice is ready. 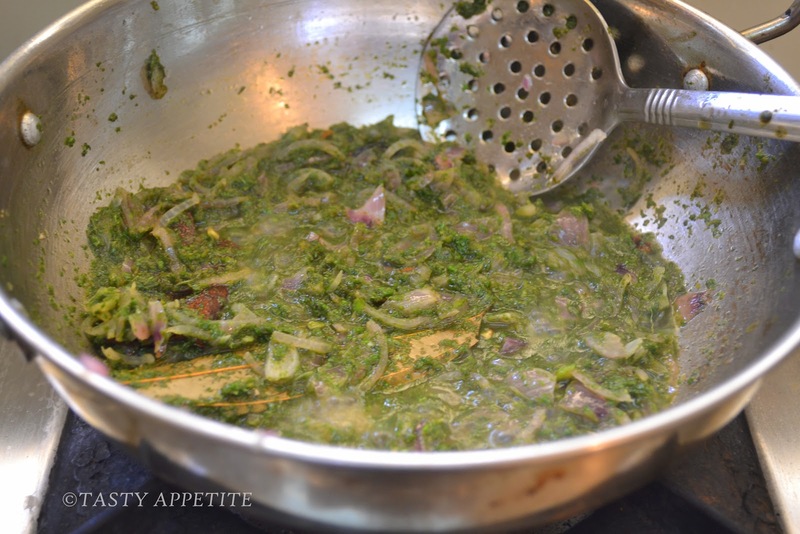 14.It tastes delicious with any of your favorite chips, curries or with chutney. I can see why this is a family favorite! Looks delicious! 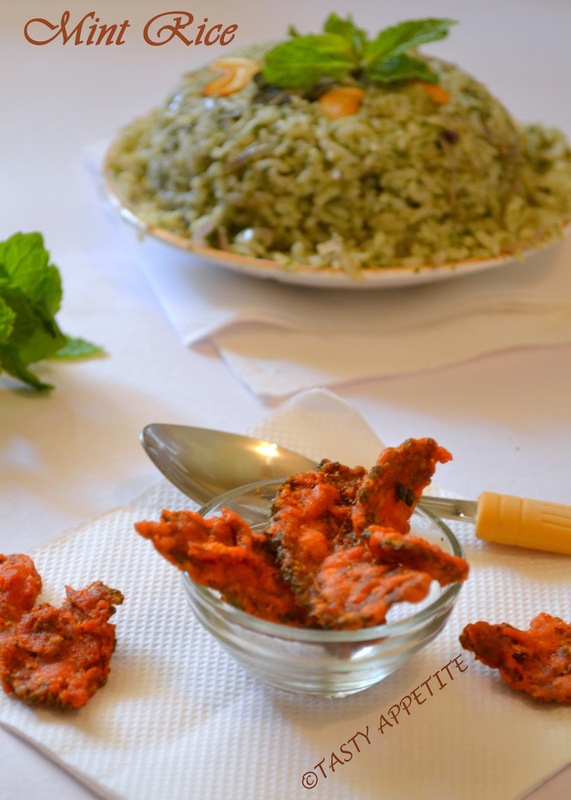 Yummy Flavour with pudina. Too tempting. Delicious and flavorful.. Reminds me of mom's pudina rice.. This is a great dish. Simple n a meal by itself. wow dats such a refreshing rice !!! Looks delicious. And are those bitter gourd chips to accompany it. Lovely! 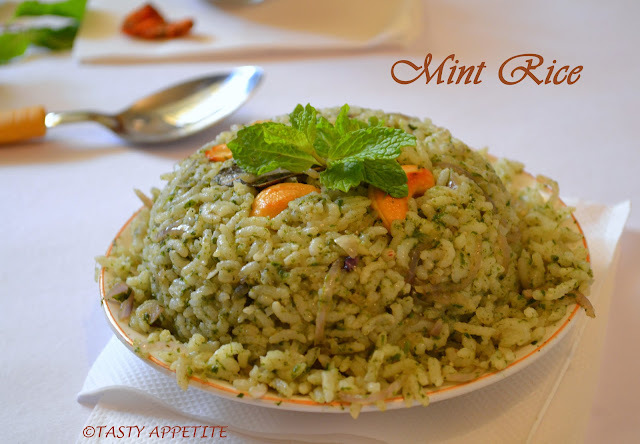 Delicious mint rice yummy one pot meal. Nice flavorful recipe Jay. Somehow I did not get the mint rice right with several recipes. I will try this one. Nice flavor and a very attractive presentation ! Flavorful and healthy rice J!!! Ah, I can smell it here :-). 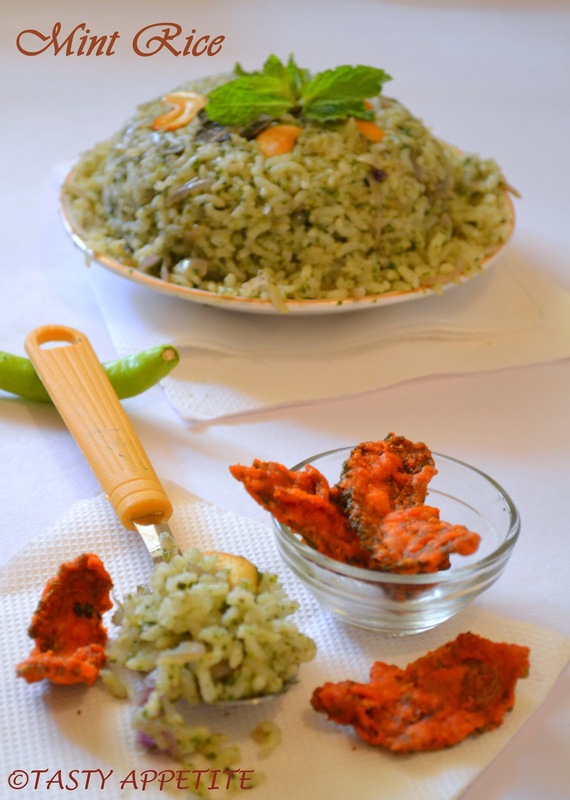 Love the pudina pulav. Wah really a flavourful rice. If we can eat with our eyes, then I just finished eating them!!! so droolworthy pictures!! nice presentation.. love the flavor of pudina.. 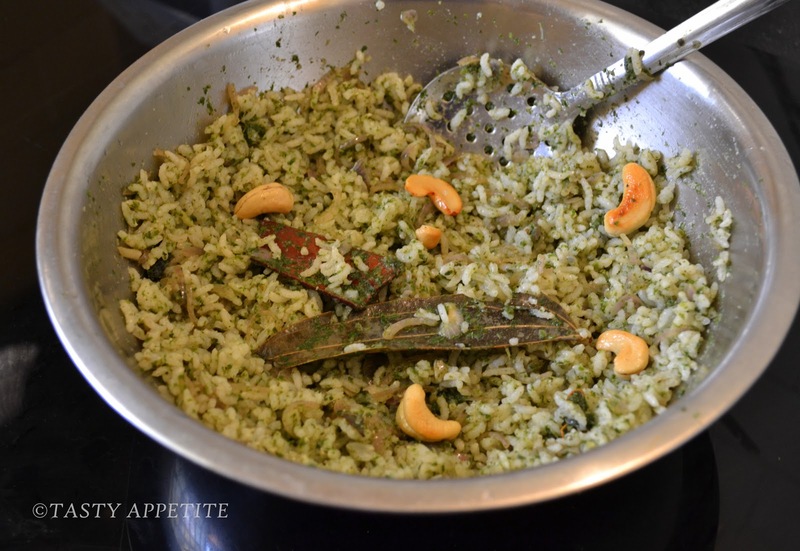 Healthy and very flavourful rice!! One of our regular lunch meals!! No wonder it's your family's fave rice dish ! It looks so appetizing ! Healthy and flavorful rice jay. Can imagine the taste and flavor,yum.. 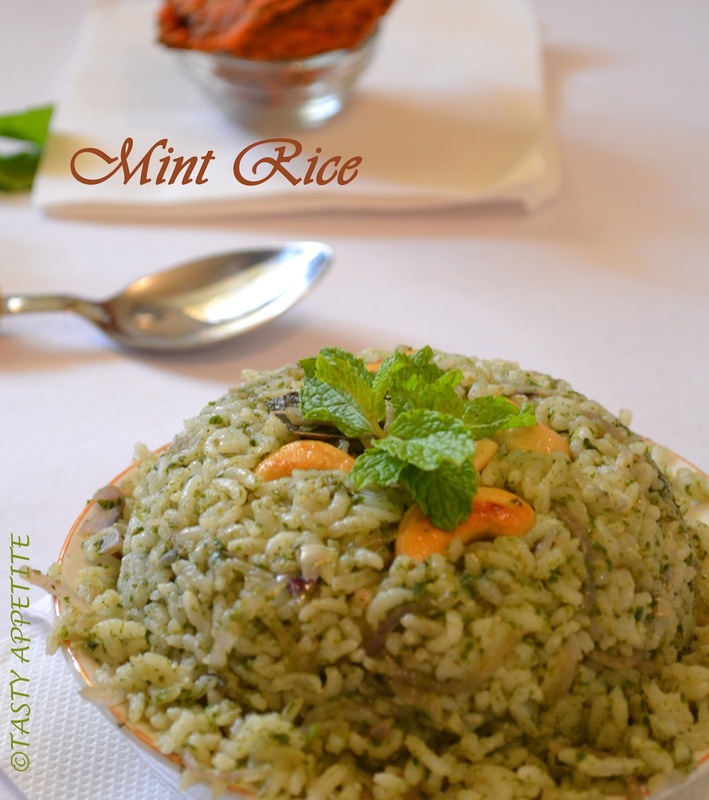 Simple and very healthy rice..
def one of my fav rice.. So so so delicious and perfect looking rice.. 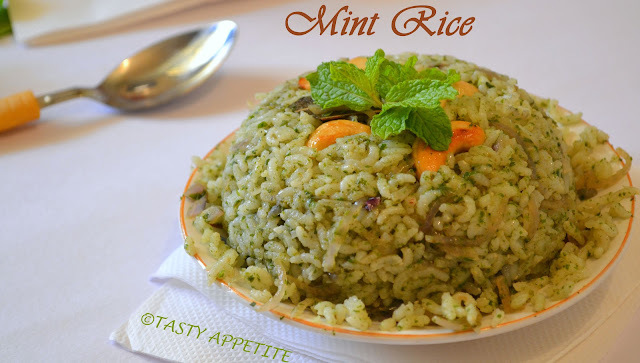 Very tasty and refreshing rice, love the minty flavor..
Yum,what a flavorful and delicious rice preparation. Delicious and flavorful.. looks tempting..thnx for sharing the recipe with east instructions..